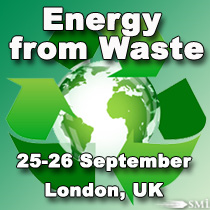 SMi's 6th annual conference will explore the market and provide the perfect platform for attendees to discuss current issues, technologies and innovations in Energy from Waste. Plans announced for the capital's first heat from waste network. The heating network will be the first of its kind in London and will mark the first time that the heating potential of the SELCHP facility has been fully realised since it was built in 1990s. The scheme represents an overall investment of £7 million and is forecast to be complete by the end of the year. The pioneering scheme will provide sustainable and secure heating for the Southwark homes it serves and promises to deliver long term energy cost savings to residents. With senior industry representatives presenting on their own experiences and referring to case studies, success stories and failures, this event promises to be a unique forum for networking, sharing ideas and developing partnerships with key professionals in the Energy from Waste industry.